The ancient origins of Kava drinking is known to trace back at least 3,000 years and is associated with both social and ceremonial function. It was, and is, highly valued for its medicinal uses as a sedative, muscle relaxant, diuretic, and as a remedy for nervousness and insomnia. But Kava is more than a traditional remedy for a variety of ailments. This botanical marvel has been used in parts of the Pacific at traditional social gatherings, and in cultural & religious ceremonies to achieve a "higher level of consciousness". Kava, which is sometimes known is awa, is produced from a plant typically found in the western Pacific and is traditionally drunk by many of the island cultures of the Pacific Ocean, including Fiji, Vanuatu, Hawaii, and Polynesia. In Fiji, for instance, the kava drink is considered the national drink, and is widely consumed. Traditionally, kava was prepared by cutting the root into small pieces, being chewed by several people (often children or beautiful young women, because of their perceived reduced bacterial levels!) and spat into a bowl, where it was mixed with coconut milk. It was believed that the chewing procedure blended the root with enzymes in the saliva and promoted the extraction of the active ingredients of the root and generally produced a much tastier brew. The concoction was then strained through coconut fibre, squeezing the pieces of masticated root until all the juices were blended with the water. This was then decanted into another bowl for consumption. Nowadays, the root is ground, pounded or grated rather than chewed and spat out, although among some locals the traditional method is still practiced. Preparation of the kava drink . Photo source: twenty-somethingtravel.com. Although the drinking of kava may be quite casual, it also plays a central role in many ceremonies, including marriages, funerals, healing ceremonies, naming ceremonies, and initiation for young girls and boys. It even played a part in the coronation of King Tupou, the Sixth of Tonga, who took position in 2012. 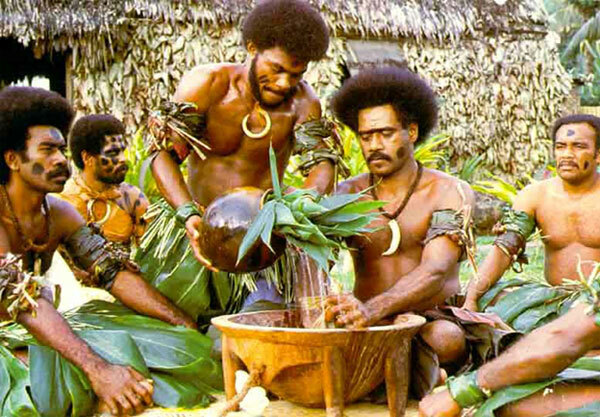 In Fiji, the kava has a symbolic function of bringing two groups of people together. When one visits a new village, it is obligatory to bring the kava root as a gift. The community then gathers to prepare the drink, and the communal drinking then begins. After the village chief has his cup of kava, the drink is offered to the rest of the community in a communal bowl. Before receiving the drink, tradition dictates to clap the hands once, then after finishing the drink, one has to clap three more times. Once the ceremonial drinking is complete, everyone gathered would be friends, and the rest of the celebrations can begin. The kava drink is neither an alcoholic beverage nor a psychedelic drug. Nevertheless, it does have sedative and anaesthetic properties. Whilst the effects of the kava drink may vary from one person to another, they are generally as such, if taken in a small amount: a mild feeling of sleepiness and drowsiness, relaxation of the body and the muscles, feelings of happiness, and numbness of the mouth, tongue and throat. When taken in a larger quantity, the kava drink may cause the loss of muscle control, sleepiness, the reddening of the eyes and the dilation of the pupils, and a general feeling of sickness. Although the short-term effects of drinking kava may be mild, it has been claimed that its long-term usage can be quite severe and may cause various problems. These range from less severe effects such as the weakening of the muscles to more serious ones such as liver failure. By the end of 2002, at least 68 suspected cases of kava-linked liver toxicity had been reported, including nine cases of liver failure. Six of these cases resulted in liver transplants, while the other three ended in death. As a result, European, Asian, and North American countries banned the sale of all kava products, resulting in the collapse of the kava export industry in major growing areas. The reports of liver damage due to kava consumption have been puzzling, as inhabitants of the Pacific islands have been drinking the kava drink for at least three thousand years without apparent liver damage. Many believe the ‘kava scare’ was engineered by the pharmaceutical industry because Kava was being widely prescribed in Europe as a safe and effective alternative to synthetic drugs sold by pharmaceutical companies. 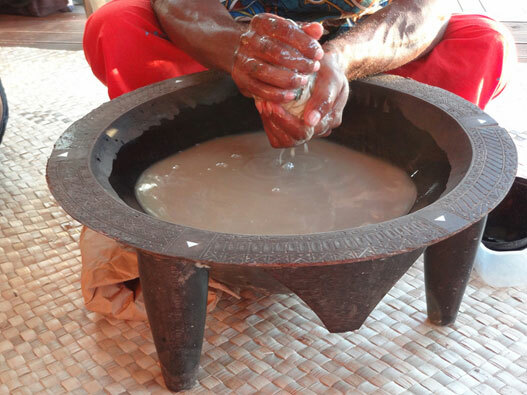 Featured image: Traditional Fiji Kava. Photo source . Benjiman. The white man found Tonga before Samoa and Fiji and influenced your people to become like them thats why Tongan people are so proud of themselves for achieving nothing. Out of Samoans and Fijians Tonga allways has something to prove lol you know why? Its because you guys are a younger nation. Fiji and Samoa gave birth to Tonga. Everything you guys have came from Samoa and Fiji. Your one arrogant and Ignorant Melanesian. Samoa admit they got the kava from us Fiji and we admit we got it from one of our big brothers Vanuatu.But the only one that has a white version of the story is Tonga. Sit Down, Be Humble. Learn to show your pride for Tonga in humbleness and if its you think its not true go and research it. When you find the truth embrace it. Ill give you a boost. Research the Lapita people. That is the best place to start. It's called Kava..originated in Tonga. It's actually called Kava Tonga. The name kava is from Tongan and Marquesans. This dates back to the early 1800's when the first king of Tonga introduced kava to Fiji after the war, up until this day in ceremony's before they drink the kava they will 'fu' 3 times before they drink in respect of the king. Most likely the liver damage was from some other source and, as with many non-medicinal but beneficial substances, only attributed to the kava by the medical community. Kava has been used by thousands of people over many generations with no bad effects. It has an earthy flavour but is not unpleasant. It is used in herbal medicine for its sedative properties.